The weather has finally settled down and it was time to get on with my garden landscaping! The previous homeowners had created this raised bed garden and, after much work on my part,you can read about it here, I finally have some things planted in it. Normally, I grow my own tomatoes from seed but with this year I took the easy route and bought three plants. A Better Boy, a Roma and a Beefmaster. In front of them I have planted cucumber seeds. We are hoping to get enough to can up pickles again this year. In front of and in between the plants I have some marigold flowers. I am hoping they bring in the bees and help to pollinate once everything gets to that stage. 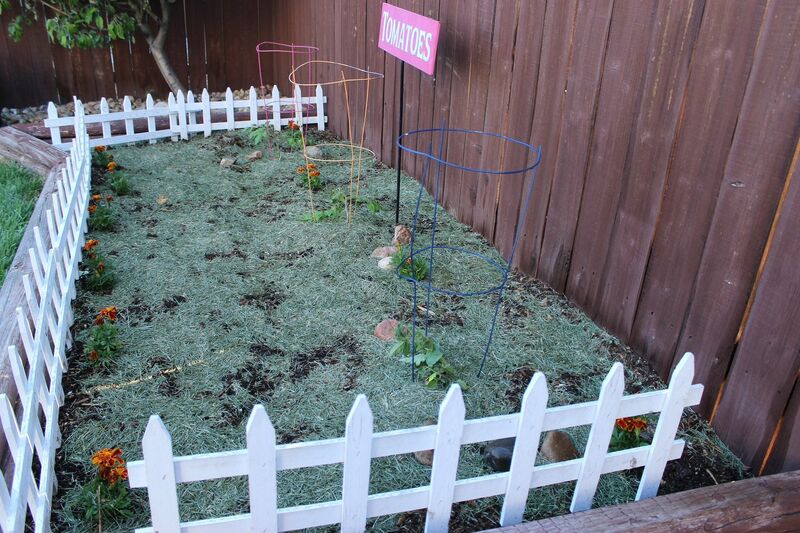 I covered it all with fresh lawn clippings to help retain moisture and to keep the soil warm. The white fence will have to stay up for a bit. Max LOVES to get in there and roll around in the dirt! Silly pup! 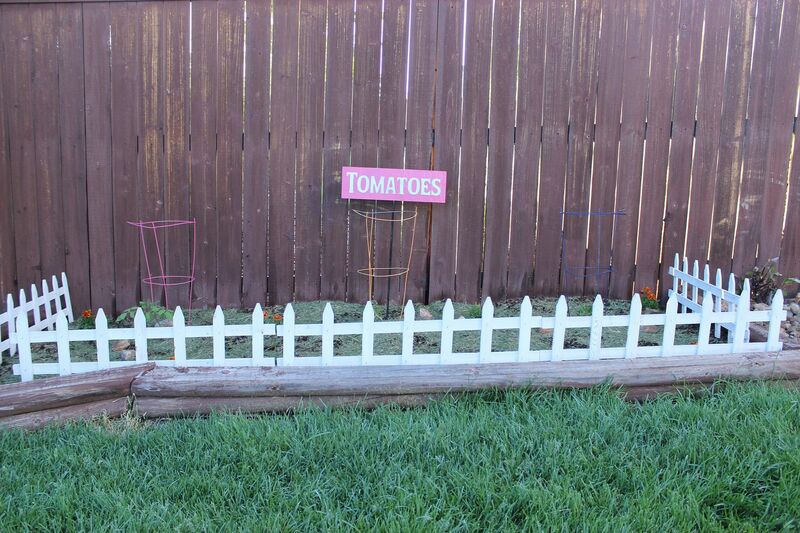 My Grandchildren Garden is coming along. 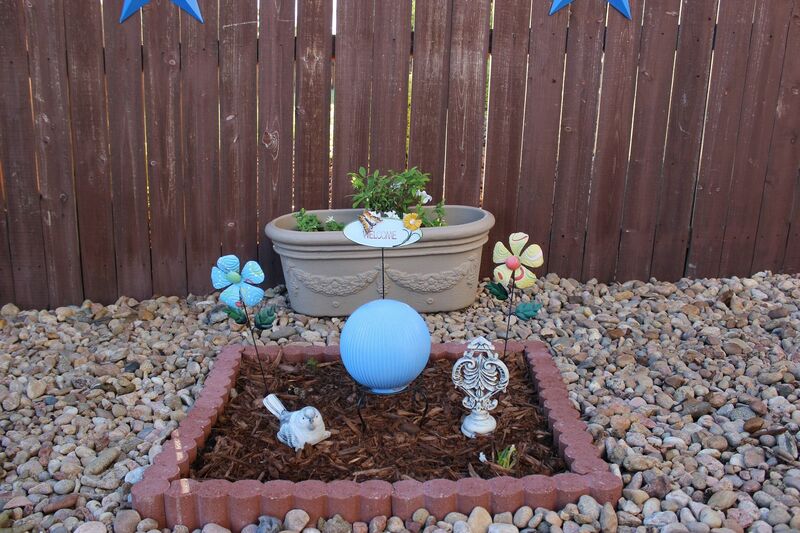 I added some garden art for color and interest until the plants start coming up more. The container garden behind it now has a blueberry bush and some petunias. 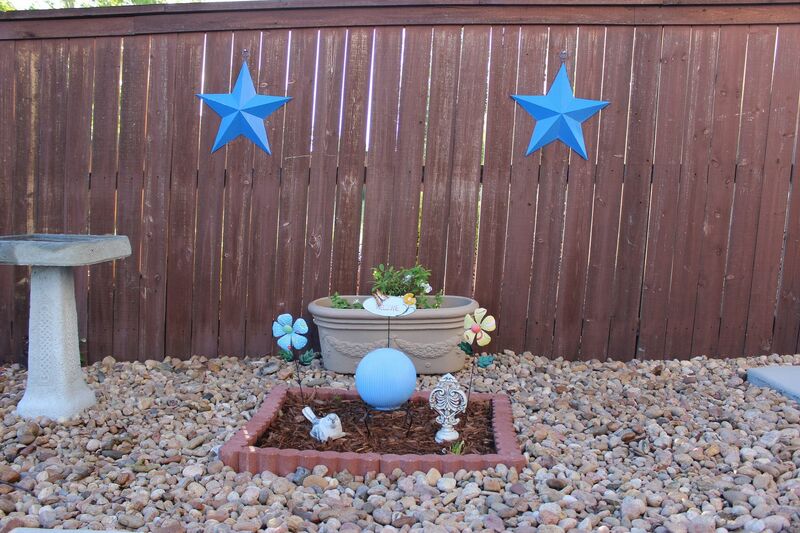 I also added a couple of the stars you may remember from my beautifying the wooden fence project post from our previous home. Speaking of container gardens, my herb container garden is also doing very well now that the sun is shining and the temps are in the 80's! So far, I am pleased with my smaller gardening space. I know my back sure loves it! Stay tuned for more updates as I have been busy planting containers with flowers too! 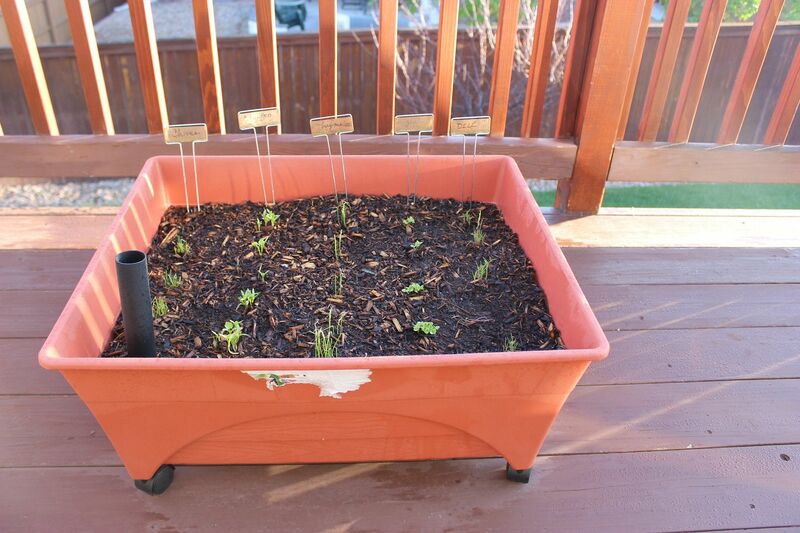 What is that tube in the herb garden for? It's so you can add water and the soil soaks it up so that you don't over water and don't mess with the tender plants. I learned something new! Your garden looks great...I need to start getting my yard in shape! Oh an herb garden would be such a treat. Yours is fabulous. Looks great, Kathe! What have you got planted in the Grandchildren's garden? Love your gardens Kathe, I planted a Hydrangea and have been babying it...so far so good! Love how your garden is looking! You know I'm a huge fan of the Grandchild garden and of course herbs are wonderful to grow. Hope you tomatoes come in soon! I'm trying to grow bell peppers from seed, a difficult task as I've been told. I can't really have tomatoes here, because there are too many squirrels around. My neighbours tried last year but I don't know how successful they were. Your herb garden looks lovely. Totally jealous of your garden Kathe! I have a black thumb and tend to kill everything I plant. I'll be living my garden dreams through you, ok? Lots of work, but worth it! Looking good Kathe! You know if you miss a larger garden I can give you directions to a much larger garden with a list of things that need to be done! LOL What herbs did you plant? Looks fun and lovely. I need to start gardening. I love using the fence as a place to decorate! 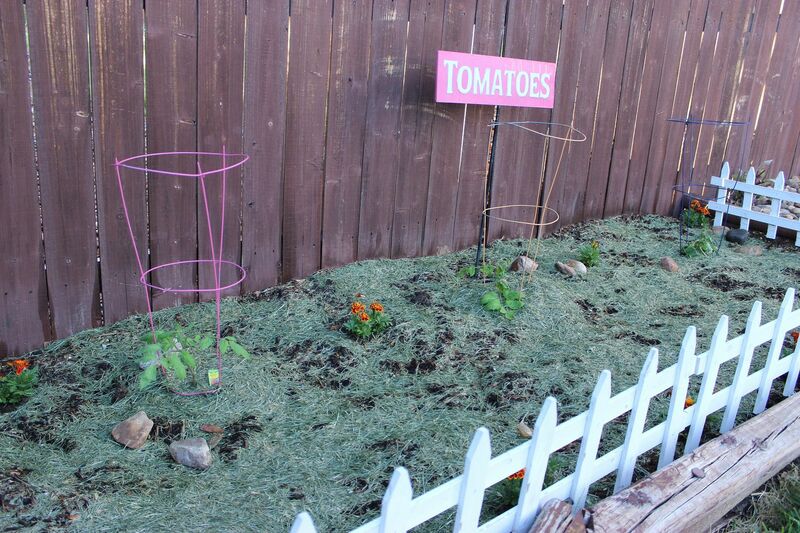 Kathe, your garden looks so much better than mine! We've planted twice already (once killed by late freeze, once mowed by deer). We returned home last week and again our garden is chomped down to nubs. I believe it's time for an electric fence! looks great! 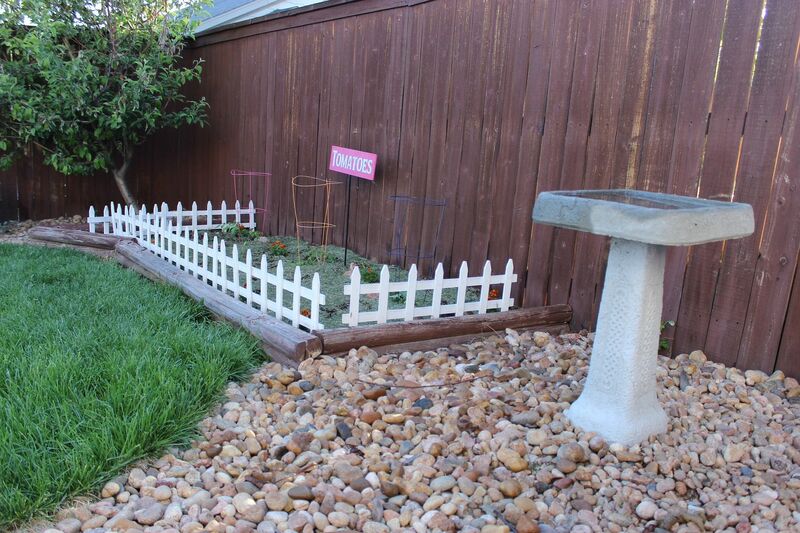 I love the little white fence and the grandchildren area - I need to add one for mine! Looks wonderful, Kathe! I hope you post the full growth later in the season and share it with us. I'm excited to see how you harvest your crops. I adore your layout too. Thank you so much for sharing with us at Snickerdoodle Sunday! Pinned and stumbled! Grow baby, grow! Oh I envy your tummy all those wonderful tomatoes and fresh sauce!